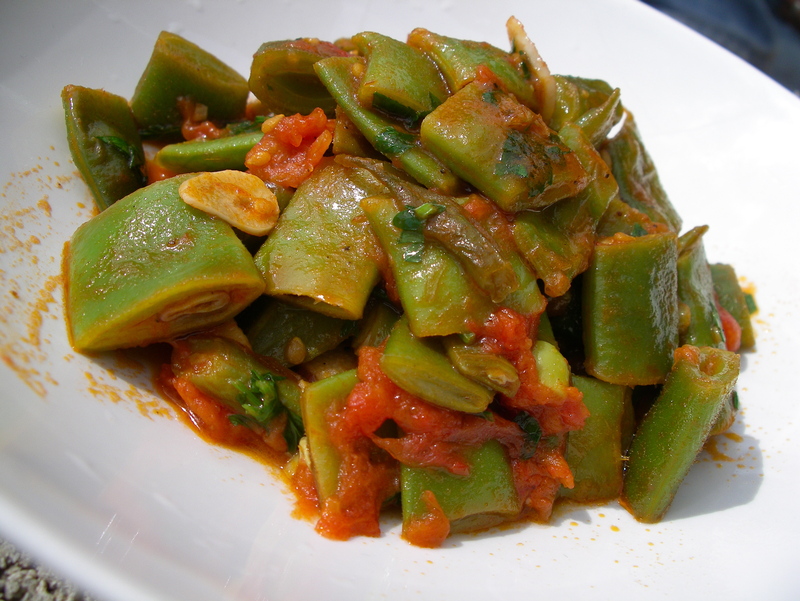 This little dish of runner or green beans gently stewed in oil and tomatoes has long been a favourite of mine. Its origins are probably Turkish or Greek. I remember eating several variations of it in Istanbul and in Greece many years ago. Like so many Mediterranean dishes it has few ingredients but the finished result is miraculously full of flavour. Serve as a side dish or part of a mezze spread or picnic. Heat the oil in a sauce pan, throw in the onion and garlic and fry for a couple of minutes then add the beans and tomato. Season and stir over a high heat to coat well. Reduce heat, cover and let the beans stew in the oily tomato sauce for 15-20 minutes, keeping an eye on it to make sure it doesn’t catch on the bottom, if it does add a little more oil or water. Serve as part of a mezze or as a side dish. COOK’S TIP To freeze French beans; wash, top and tail and plunge into boiling salted water. I use a pasta pan with a removable drainer, which makes the job much easier. As soon as the beans turn a brighter darker shade of green (3-4 minutes) drain and plunge into ice-cold water to halt cooking and preserve the colour. When cool, drain well, bag up and freeze immediately. Gardeners Note Great for gluts of beans and tomatoes in summer but it can also be made at any time of year with frozen beans and preserved tomatoes.